I need your help in choosing which haircut I should go for. I haven't had a good haircut since August 2009 in Singapore by my friend Jackie. I was so happy with that last haircut. It has grown into a chin-length bob since then and has kept its shape. I plan to get a haircut, color and highlights before I leave for the States next week. Salon services are very expensive there (And very affordable over here! 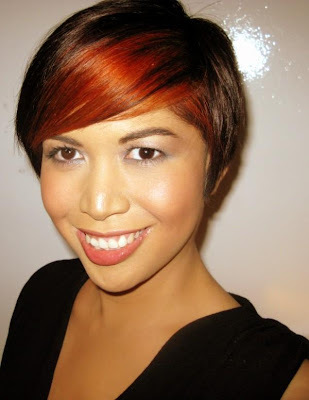 Non-Filipinos: $10 for a fantastic haircut by a reputable hairstylist is very common in Metro Manila). Please remember that I have naturally stick straight hair. Disclaimer: I don't plan to go blonde! Please let me know what YOU think because I value your opinion. You can cast your vote on the poll found on the right side of this blog (just below the "About Me" section). I am getting my haircut on Thursday so you have two days to tell me which style will work better for me. If you have additional comments, please leave your thoughts in the Comments Section below this blog entry. I voted! I think #2 would look really good on you. i voted for #2... can't wait to see your new hairstyle! Of course I DO remember you! How are you guys? Please keep in touch when you;re in the US already. Love your hair #1... so chic!